1) It still has not been confirmed that Brig. Gen. Kerr was actually a plant from Hillary Clinton. He is, however, and individual capable of making his own decisions. And, in full disclosure, a part of a large group of people who have thrown their lot in with Ms. Clinton. There are sixty-four (64) other names on the taboo list - including Billie Jean King. As of this posting, there have been no comments from the Clinton Camp. 2) Brig. Gen. Kerr has been gay for a long time. He did not come out of the closet conveniently for the CNN/ You Tube Debate. In a keen piece of research on my part, I found this link to a 2003 interview with Brig. Gen. Kerr on Talk Of The Nation (the whole interview is very interesting, but 50 minutes long. The first few minutes are worth the listen, however.). So Kerr has been openly gay for at least four years, back when Hillary was just an outrageously dressed Senator (pictured). 3) Regardless of his motives for being at the debate, the candidates believed (and very possibly correctly) that Brig. Gen. Kerr's comments came from a concerned citizen and a retired military officer only. Bloggers and News Networks will, I'm sure, continue to spin this as Clinton's fault. But the truth is that there is still a vicious prejudice and gross misunderstanding surrounding the topic of homosexuality. 4) This is the last one, and the most ironic in my eyes. The original Don't Ask, Don't Tell legislation was signed into law by my fellow musician Bill Clinton. Brig. Gen. Kerr is an alleged plant of Will's wife, Hillary, but Kerr is condemning the bill. Does that sound like a good campaign strategy to you? For a more in-depth look at the law itself, and some analysis surrounding the conversation, check out Stanford's Law School project here. Thanks for making it this far. I'm political in my daily life often, but I promise not to over-do it here. This video just hit me so strong. I would love to know what you have to say on the subject. "To force [people in the military] to work in a small, tight unit with someone who is openly-homosexual...is I think a disservice to [straight people]." Here is Congressman Hunter's contact information. Just in case you want to let him know how much a disservice it would be. I ride a fixed gear bicycle (pictured). They are also known as track bikes. Or, more popularly as messenger bikes, due to their large prevalence in New York, San Francisco, Chicago and other cities where the vocation of messenger is still alive and well. These bikes have one gear, and only one gear. They are not a "single gear" bike that allows the user to coast, like a Cruiser, or a BMX bike. If my back wheel is in motion, so are my legs. They do not have twenty-one (21) speeds for me to pick and choose from. My chain is connected directly to the cog that makes the back wheel move. No technology. Yesterday, I stopped by onePlace on the way to class to say hi to Kevin and Mark. While our friend Ace was riding around on my bike, Mark made a comment about progress. "You know, there is a way to have the bike keep going when you aren't peddling. And to change gears to adjust resistance. It just doesn't make sense to revert back to only one, fixed gear. Technology should always be moving forward." I stood there awhile with nothing to say. He makes a viable argument, but it just didn't sit well with me. I know that technology is good - for society, the economy, adult entertainment, and many other things. We developed cellular technology, and I haven't lived in a place with a land line for four (4) years. Furthermore, our phone numbers don't start with the city's name any longer. You have a better chance calling 867-5309 than you do Pennsylvania 6-5000. And even if Jenny wasn't home, you could leave a message on her voice mail, yet another mad advance in this crazy world of ours. The Group will show no work at any time that does not conform to its standards of pure photography. Pure photography is defined as possessing no qualities of technique, composition or idea, derivative of any other art form. Purity. This was it, I found my answer. People sometimes revert back to a single, fixed gear bicycle because they desire the purity of control. Much like how Porsche and Ferrari still offer their vehicles with manual transmission as standard. Purity of control. Sometimes people are so fed up with the direction of photography, that make a pact to avoid glossy prints, and narrow focus. Sometimes a callback to the basics is really rewarding. This one might be a stretch, but what if there is a group of people who decide to rebel against the technology of warfare, and engage in the purity of diplomacy? Neat idea, huh? So next time you see someone without a digital camera, automatic transmission, or a ten (10) speed bike, remember - technology doesn't always have to move forward. "Being thus and no other; containing nothing that does not properly belong." PS- Here are some cool things you can do with a fixie. I was putting off a presentation for a class earlier today, and stumbled across a blog titled, You Thought We Wouldn't Notice. The people behind this brilliant site are dedicated to calling out people stealing design and art. Most recently, YTWWN took a stab at Apple, claiming they stole from my good friend Ben Gibbard and his side project The Postal Service. Here are the videos. Enjoy, and see you soon. "He's as cool as the other side of the pillow." 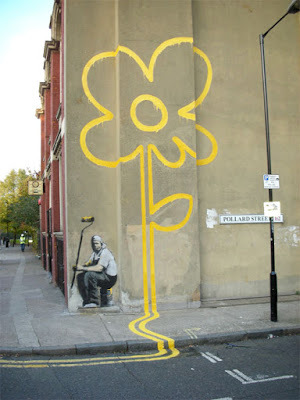 My mother doesn't like the fact that I'm enamored with street art. 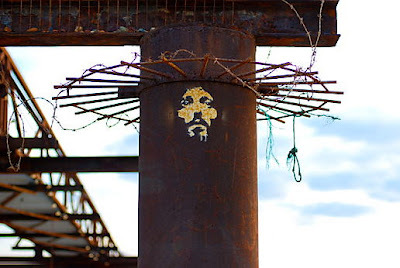 "Graffiti is not good, and calling it street art sounds like justification." But I do like it. And here are a few recent finds from my friends over at the Wooster Collective. Would love to know your thoughts. Especially on the video. "A wall has always been the best place to publish your work." Today marks the traditional start of the Holiday Shopping Season. With that in mind, here is a link to the Downtown Phoenix Journal's recent article on the benefits of shopping local - plus some tips on how to do it. Also, the City of Phoenix will be collecting items for those who won't otherwise have a comfortable Christmas. Blankets, warm clothes, and warm shoes are all being accepted (full list here). It is really easy for me to forget how much the weather changes here in the Valley. Without a roof or a heater, our winter nights can be fairly grueling for our Street Family. The program launched this past Tuesday and will run until the middle of March. That's all for this week. Good wishes to you and your family as we enter into this Holiday Season! This Friday is National Buy Nothing Day. Traditionally, the media labels the Friday after Thanksgiving as "Black Friday". Named after the cheery events of Black Tuesday, the day is marked by above average sales, long lines, and a myriad baiting schemes. 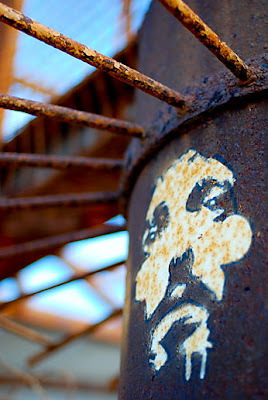 Adbusters is an organization determined to limit our consumption as a human race. They sponsor Buy Nothing Day, but it is largely a grassroots campaign. Their website has some startling stats, and fairly humorous videos. Have fun poking around. And don't buy anything on Friday. Quick note: The end quote is long today. I hope you can make it through to the end. It's worth it, I promise. "Our gross national product ... if we should judge America by that - counts air pollution and cigarette advertising, and ambulances to clear our highways of carnage. It counts special locks for our doors and the jails for those who break them. It counts the destruction of our redwoods and the loss of our natural wonder in chaotic sprawl. It counts napalm and the cost of a nuclear warhead, and armored cars for police who fight riots in our streets. It counts Whitman's rifle and Speck's knife, and the television programs which glorify violence in order to sell toys to our children. Yet the gross national product does not allow for the health of our children, the quality of their education, or the joy of their play. It does not include the beauty of our poetry or the strength of our marriages; the intelligence of our public debate or the integrity of our public officials. It measures neither our wit nor our courage; neither our wisdom nor our learning; neither our compassion nor our devotion to our country; it measures everything, in short, except that which makes life worthwhile. And it tells us everything about America except why we are proud that we are Americans." On Sunday evening, the New England Patriots improved their record to an impressive 10-0. Ten wins, no losses. People are pointing to the coaching of Bill Belichick, the superhuman skill of Tom Brady (pictured), or their top notch defense - with or without the aid of a little extra tape... But I am here behind the keyboard to suggest something else; it's the clam chowder. - The Boston Red Sox recently completed a sweep of the Colorado Rockies to become the 2007 World Series Champions. The second time in 4 (four) years. - This past Sunday, the New England Revolution played in the MLS Cup for the second time in as many years. - The Boston Celtics are off to an impressive start. 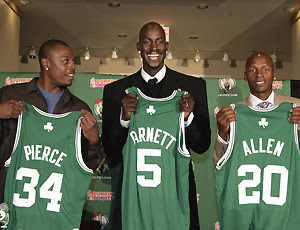 The 8-1 Celtics are led by Paul Pierce, Ray Allen, and recent acquisition Kevin Garnett (all pictured). - The Ivy Title was won in commanding fashion by the Harvard Crimson 37-6 this past weekend. Harvard was unbeaten in conference play. - The Eagles of Boston College are currently ranked #14 in BCS rankings and are led by Heisman hopeful Matt Ryan. The Eagles look to clinch a Bowl Game on Saturday when they host the Hurricanes of Miami. So there's my two cents. It's the chowder. It's not scientific, of course. The soup isn't the only thing creating winners. If that were the case, the Revolution would have won the championship, the Celtics would have won that nail-biter this weekend, Matt Ryan would be more consistent in throwing the ball, and the Boston Bruins would be at least better than mediocre this season. Maybe I'm just jealous. I've been a devoted Cardinal's fan through the 20 (twenty) rebuilding seasons, I wore purple until the baseball gods had mercy on Diamondbacks fans, and I watched with knees-together-hands-at-the-belt solidarity as Nash got hammered in the goods last year. So maybe I am jealous. I want the legacy. The titles. The prowess, and the good food. Chowder brings championships. The only thing our local fare brings me is gas. "I could talk food all day. I love good food." - "I'm pleased to begin my remarks tonight with some very good news: the most disruptive part of light rail construction is done!!" - A proposal to expand the DASH (Downtown Area SHuttle), creating more connectivity between ASU's Downtown Phoenix Campus and City buildings. - A proposal to expand the Parks and Preserve Initiative (PDF link), creating more open shade spaces for the downtown area. - An invitation for ASU's College of Law to relocate downtown in order to be closer to city, county and state courthouses - not to mention the myriad prestigious law firms that have offices within blocks from campus. Much more was proposed and said, and the full text can be found here. One little side story - Over the course of the evening, Gordon invited a variety of different people up to the stage. All "Downtown Rock Stars" as he called them. Two of those were Bill and Verdeen Jackson. The Jacksons were some of the first people to call Downtown Phoenix home when they purchased their condo in the Orpheum Lofts. But Mayor Phil opted not to tell the audience that Bill and Verdeen are selling that condo, and that it's been on the market for over a year. In fact, a couple of friends and I actually got to walk through it on a loft tour just a couple of weekends ago. On the day following the assassination of Martin Luther King, Jr., Jane Elliott decided to take her third-grade class through a now famous exercise. She divided the class into two groups - those with blue eyes and those with brown eyes, with the intention of teaching young children the dangers of racism. On the first of two days, Elliott announced to the class that Brown Eyed people are smarter, funnier, faster at doing math problems, and prettier. In contrast, those that are Blue Eyed are wasteful, not smart, and are not good enough to drink from the same water fountain. This verbal conditioning lasts the morning. By the end of lunch, it was internalized. Fights broke out because one boy called another a "Blue-Eyed". Two girls that were best friends the day before now sat on opposite ends of the lunch room, saying negative things about the other to a newfound group of comrades. The afternoon brought no new comfort. Elliott continued the verbal bashing of the Blue-Eyed group and chastises them for any minuscule crime that is committed. The children go home demoralized - or emblazoned, depending on which new identity was a reality - and anything but eager to return the next day. When class does begin again, the roles are reversed. Now, those with blue eyes are the superior group, while those unfortunate enough to born with brown eyes sit dejected and outcast. Elliot gets away with the "Romney"-like flip-flop due to the fact that her students are seven (7) and eight (8) years old. The day unfolds in a similar fashion and the children go home- stronger and confident, or broken and hurt. The exercise was highly publicized (not Elliott's doing, but the media) and Elliott toured the nation to hold seminars and workshops in the following years and decades. She also was hosted by PBS Frontline, The Tonight Show and Oprah. As we watched these conversations and exercises in class yesterday, I was struck by the relevance of it all. Racism is still very much alive in our country, in our city, and in our neighborhood. To keep your attention - and mine - I'm not going to delve into a long-winded discussion on what should be done to confront these issues. What follows is an excerpt from the conversation that followed the exercise when Elliot visited the Oprah Show. During this run of the exercise, it was assumed that those with blue eyes were the inferior group, and were treated unkindly during the entirety of the show. Elliot's response to an off-the-cuff remark is gold, and the reason why I spent so many words giving this situation background... The italics are mine. Blue-eyed audience member: In America, we are the melting pot of the world, and we should be able to be tolerant, and you shouldn't dislike me because I'm white and I shouldn't dislike you because you're black. Jane Elliott: Now, wait a minute, people—what do you mean by melting pot? That we put everyone together and mix them up, and they all come out the same? So that white folks feel comfortable with them? So that blue-eyed folks feel comfortable with them? We don't need a melting pot in this country, folks. We need a salad bowl. In a salad bowl, you put in the different things. You want the vegetables—the lettuce, the cucumbers, the onions, the green peppers—to maintain their identity. You appreciate differences. A melting pot does not appreciate differences, and this country ought to be about appreciating differences. This country ought to be about appreciating differences. Beautiful. "Sympathy is not a substitute for action." After some weeks of contemplation, I have decided to throw my lot back in with the blogging world. This will be my third crack at it. And they say that the third time is the charm. But I don't know who they is and I disagree with the underlying assumption that my first two attempts were failures. The point is - I'm back. Downtown Phoenix has a reputation for not being a very a friendly place after the sun sets. As a full time student at Arizona State University's Downtown Phoenix Campus, I know firsthand that Downtown Phoenix is anything but Deserted After Dark.